I may be biased toward ultralight gear, but a select few heavier items have a place in my heart as well. 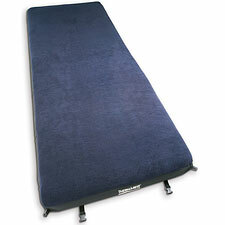 Case in point: Thermarest's luxurious DreamTime sleeping pad. Calling the DreamTime a sleeping 'pad' seems a little misleading. The well-named DreamTime offers the comfort and warmth you'd expect from a full-size, stay-at-home, quality mattress. I must confess that in fact I did not buy my DreamTime pad for use in the backcountry or even for car camping trips. No, I got mine to replace an aging AeroBed, hoping I'd get a better night's sleep. Yes, I sleep on the floor these days, the consequence of having not one but two kids 3 and under. So when I say the DreamTime is comfortable, I'm not just saying it fares well compared to, say, Thermarest's excellent but ultralight NeoAir pad or the Old School RidgeRest. Of course it's more comfortable than regular pads. What impresses me about the DreamTime is that it replicates the feel of my beloved but sadly unavailable queen bed—in a far more tidy package. How does the DreamTime work its nocturnal magic? The DreamTime consists of three elements: a traditional but generously-sized inflatable Thermarest sleeping pad, a silky-smooth cover, and an Isotonic memory foam pad. The genius of the design is that it doesn't in the least feel like an inflatable pad. The foam/inflatable combination gets the softness/firmness equation just right. And the depth of the padding is thick enough for side sleepers to feel comfortable even though they're on the floor. At 25 inches wide, the pad might seem a tad narrow for the luxury category. However, the DreamTime has attachment straps that allow it to be easily joined to another DreamTime pad to form a full-size bed. Note that the DreamTime comes only in two sizes: Large and Extra Large. You will absolutely notice the pad's exceptionally high insulation value—Thermarest claims R 9.0. You could easily sleep directly on snow with this mattress. More importantly, home sleepers like myself don't get that awful sensation of having the floor sucking the heat out of your body at night. As for actual camping, as long as you've got a car, boat, or someone else to carry it for you, the 6-pound 10-ounce DreamTime is a perfect choice. Yes, you pay a premium for this much luxury—but maybe not so much when you figure you can use it instead of an Aerobed at home, and of course for your basecamp/car camping needs in the wild. Use it with sheets or without. The cover's microfiber top offers outstanding next-to-skin comfort, and it is removable and machine-washable. Highly Recommended.